Board-certified plastic surgeon Dr. Victor Perez can help restore your youthful beauty and self-confidence with facelift and neck lift procedures. To learn more about how a facelift or neck lift can help you reduce the signs of aging, please contact Renue Aesthetic Surgery today by completing the form on this page or calling 913-685-1108 to schedule a personal consultation with Dr. Perez. We welcome individuals from Kansas City, Overland Park, Olathe, and other areas. Facelifts are surgical facial procedures that address the signs of aging in the lower face and neck. The procedure can result in a more youthful and defined jaw line. While the facelift procedure addresses the lower facial structures, Dr. Perez may recommend separate procedures, such as an eyelid lift, to address issues in the upper face. A facelift can provide an elegant facial contour if you have begun to notice gradual sagging around your jaw line. 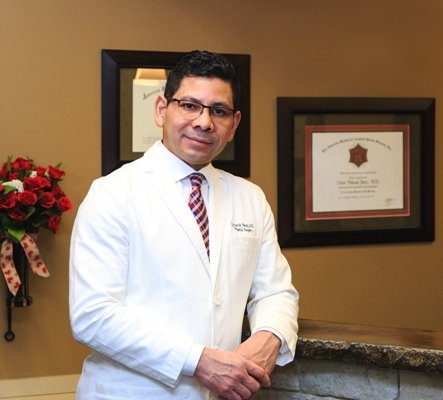 Dr. Perez has extensive experience performing these complex procedures, and he understands how to create optimal results for every patient. When you meet personally with Dr. Perez, he will evaluate your unique situation and develop a customized treatment plan that is tailored specifically for you and your unique goals. The thought of a traditional facelift may be intimidating. You may prefer to avoid general anesthesia, overnight hospital stays, and a relatively long period of recovery. If you are reluctant to commit to such an extensive procedure but still want to improve the appearance of facial aging, the Renue Lift may be an ideal solution. The Renue Lift or Laser Assisted Face Lift is an innovative and extremely effective technique that incorporates the use of the FDA-approved Smartlipo Laser by Cynosure. Using this device, Dr. Perez is able to elevate and separate the skin from the deeper tissues of the face with more ease. Initial results are seen immediately with this procedure, however residual inflammation resolution and scar maturation will take time to resolve. As you heal, thermal-induced collagen synthesis and reformation is taking place at the cellular level, promoting new collagen formation which leads to tightening of the skin. Final results may be seen at six months to one year or longer as the deep inflammation subsides. This procedure has a long duration of results, but as the body ages, you’ll need to remember that the best results are maintained by following a healthy lifestyle that includes diet, exercise and skin care. Factors such as the normal aging process, stress, and sun exposure will always cause one to age more rapidly. Take a look at our Facelift/Renue Lift before and after gallery to see what we have been able to do for some of our patients. Loose skin around your chin or deep folds along your neck (neck bands) can make you appear older that you feel inside. Neck lifts are designed to improve the appearance of your neck and restore your youthful beauty by redefining the shape and appearance of your neck. A neck lift can involve the smoothing of neck lines, the removal of excess skin or the excision of excess fat through liposuction. Recovery can take a week or two, depending on the specifics of your procedure, your adherence to Dr. Perez’s pre- and post-operative instructions and your body’s unique healing ability.